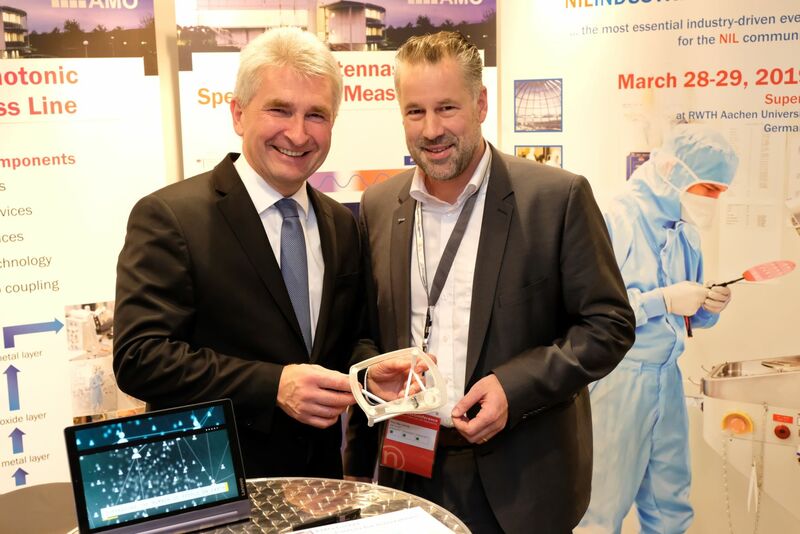 During the 8th NRW Nano-Conference in Dortmund, Prof. Pinkwart spoke with RWTH Professor and AMO CEO Max Lemme about current research on new materials and nanoelectronics in Aachen, including the interdisciplinary work carried out in the Aachen Graphene & 2D-Materials Center. The Center combines leading Aachen research groups in the fields of materials science, analytics, device technology and design and semiconductor technology. Together, AMO and RWTH investigate electronic and mechanical properties of graphene and two-dimensional materials for different fields of application. This “digital hardware” will enable future broadband communication with highest data rates, the Internet of Things (IoT), intelligent sensor networks for cities and regions (smart cities), personalized health care and autonomous driving. 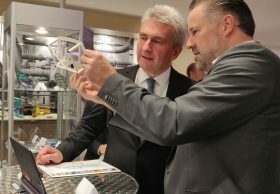 RWTH and AMO thus combine their strengths to cover the innovation value chain for digital hardware. Prof. Pinkwart tested capacitive graphene touch sensors embedded in an automotive dashboard part that are an outcome of the NRW Leitmarkt project HEA2D. He further observed an integrated circuit for wireless data transmission on plastic based on graphene, the result of a DFG project between AMO researcher Dr. Daniel Neumaier and RWTH Aachen Professor Renato Negra. In addition, Prof. Lemme explained the mission of AMO as a pathfinder for new technologies and AMO’s concept for technology transfer through industry-driven collaborative research projects and spin-outs. The largest current Project on 2D-Materials in Aachen is the Graphene Flagship, funded by the European Commission. With over 700 experts from science, industry and politics, the NRW Nano-Conference is the largest nanotechnology conference in Germany with international appeal. The conference is organized by the Ministry of Economic Affairs, Innovation, Digitalization and Energy of the State of North Rhine-Westphalia, the Cluster NanoMicroMaterialsPhotonics.NRW and the Economic Development Agency Dortmund. Please find the relating press release of RWTH Aachen University: as PDF and the corresponding article on the RWTH’s website.